Tom Norton began making his walnut drawing ink in 1995 in his basement in Cambridge, Massachusetts. In the sixties, Tom had studied art at RISD where he used a fabulous water-soluble sepia colored ink in his drawing class. He loved drawing with that ink because it worked like a watercolor bridging the gap between drawing and painting by allowing layering techniques for darker tones and lifting of color for lighter tones. Decades later after pursuing careers in theater, jewelry and print he wanted to start drawing and painting again. He visited several art stores but was unable to find that beautiful ink he used during his collegiate years. After extensive research and numerous formulations he developed his Walnut Drawing Ink. He never used real walnuts but coined the name because the beautiful sepia tones it created was very reminiscent to the walnut ink drawings created by the Great Masters. Although genuine walnut ink used by these artists started out as a dense black ink they faded over time to the beautiful sepia tones that we have come to know. Tom's ink simulates these sepia colors we appreciate but unlike genuine walnut ink it will not fade because his formula is made with light fast, permanent pigment. 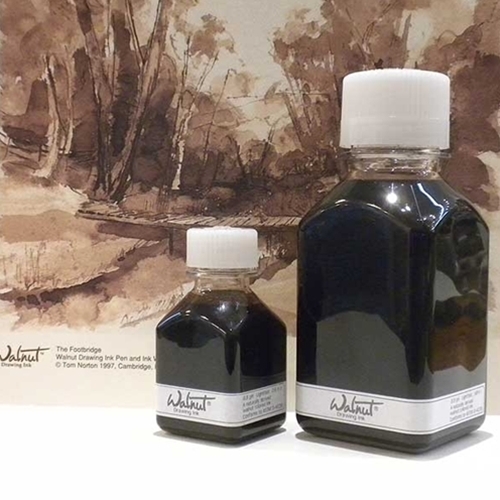 Tom's ink unlike genuine walnut ink is acid free and will not harm the paper that it is painted on. Tom never advertised or actively promoted his ink, his ink business grew exponentially simply by word of mouth and one artist seeing another artist using it. Soon ink production quickly consumed all of his time and energy. When Tom reached the age of 70 he was ready to retire and pursue new adventures in life including lots of traveling but he wanted his legacy to continue. Today Tom Norton's Walnut Drawing Ink is being made in Upstate, New York by our team of artists. We are striving to continue Tom’s tradition of excellence and have dedicated ourselves to making his beautiful ink available to more and more artists.